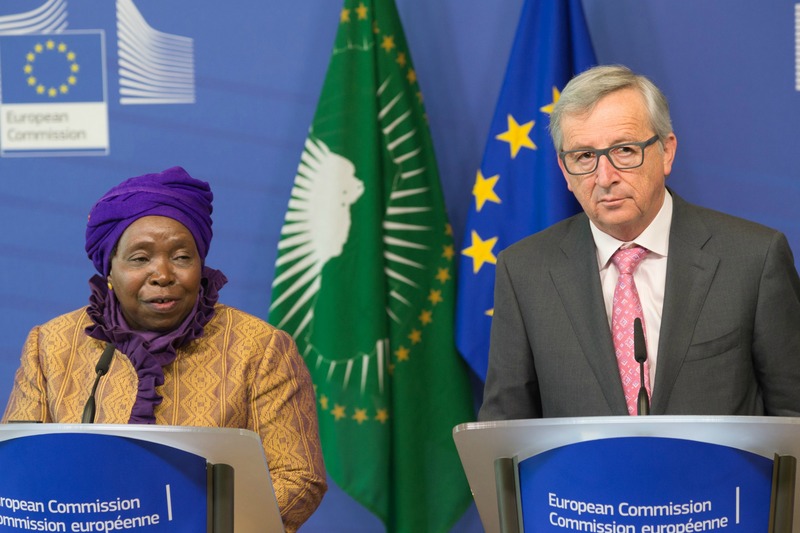 A “College-to-College” meeting of the EU and Africa was held in Brussels today, co-chaired by Commission President Jean-Claude Juncker and Nkosazana Dlamini-Zuma, the Chairperson of the African Union Commission. EU leaders will hold an extraordinary summit Thursday (23 April) on the refugee crisis in the Mediterranean, after a fishing boat capsized overnight off the Libyan coast, killing as many as 700 migrants. No matter how big the problem of drowning immigrants in the Mediterranean is for Europeans, the issue is much more acute in Africa, where in South Africa for instance, immigrants have been killed, just because a local “king” said foreigners steal jobs and should leave the country. Even worse, in Kenya, the government has given the UN three months to remove a camp housing more than half a million Somali refugees, claiming that it was a base for Boko Haram. Speaking to the press, Dlamini-Zuma said that although no miracle solution existed, some actions should be performed as a matter of urgency. One of them is to give prospective immigrants a picture of what lies ahead, and dissuade them to be victims of human traffickers. Over the long term, efforts should focus on creating livelihood. “People who don’t have a livelihood are not going to sit and die, they are going to look for greener pastures,” Dlamini-Zuma said. She added that this was not something that could be solved tomorrow, but work had to begin now, because things may get worse if leaders don’t take steps. Among other issues discussed was womens’ empowerment, including practical steps so girls go to school, and modernising agriculture. As she explained, it was high time to remove the hand-held hoe, which only accelerates the ageing of women. Young people don’t want to work in agriculture if it is not modernised, Dlamini-Zuma said. As a positive example of what the EU can do, she mentioned that in two weeks time, Poland would open a plant to produce tractors in Ethiopia. Dlamini-Zuma also said that the sides discussed how to deal with legal immigration, as the issue is often confused with illegal immigration, and how to deal with human traffickers. Both issues are expected to be on the agenda of EU’s summit tomorrow. Juncker said that the EU’s immediate priority was to save human lives. He acknowledged that the situation in Libya has been discussed. Since the collapse of the regime of Muammar Gaddafi, prompted by the military intervention of UK and France, this country is largely prey to chaos, the lawlessness being exploited by Islamic State. “We require an internal agreement in Libya. We need a stable interlocutor there,” Juncker said. The Commission President, for whom this is the first such meeting, said that Africa and Europe were “twin continents” and that the relation between them was not based on charity, but on partnership. Africa is not a neutral place for Europeans, Juncker said, alluding to the common history and common future of the continents. “This is the first time I attended such meeting,” said Juncker. His predecessor, José Manuel Barroso, has already co-chaired six such meetings. “This is the beginning of a long friendship,” Juncker added, making use of the final line from Casablanca. The African Union (AU), the successor of the Organisation of African Unity (OAU), was created in 2002 and currently has 54 member states. It is Africa's leading continental institution and principal organisation in the area of peace and security. Its main objectives are to achieve unity and solidarity on the continent, achieve political and economic integration, promote peace and security, democratic principles and institutions, as well as sustainable development. The AU is based in Addis Ababa.